A while back Laura Covey of MKL Reeds contacted me, asking if I was interested in trying some of her reeds. She has a different way of handling the whole reed thing: she has a number of reed makers (twelve at this point), and you can search for the one that works for you. She identifies the reeds by colored dots. If you order three reeds she will send three reeds out to you, each from a different maker, and you can determine if one of those dots works. When you next order you simply request that dot color. Reeds are also guaranteed and returnable (exchanged or refundable) within five days of receipt. From what she says you also don’t have quite the wait time you have with some reed makers: she gets them out within a week. She sent me six reeds to peruse, each from a different maker. They really did differ quite a lot. One had no tip to speak of. They measure from 69mm to slightly over 70mm long. Most crowed a C for me, although one was a B. Some crowed only one higher C rather than the free blowing multiple Cs I prefer. Out of the batch she sent me I found I could play on three rather comfortably and I will continue to work with those and see if they are “keepers”. I found the green, double black and double red dots to fit me better. The other three simply wouldn’t work with my embouchure. Not at all, really. The funny thing is that I know one of those would suit one of my students quite well, because he takes in so much more reed and likes to press harder on the things. But that’s just it, yes? Our bodies … our lip structure, our embouchures … they all determine what we want to work with. MKL reeds are not inexpensive. Oboe reeds are $35 a pop, and English horn reeds (I’ve not tried those, although I’d certainly love to since I play EH in symphony much of the time) are $42. Of course if you are, like me, a rotten reed maker, you will pay nearly anything if you find a reed that works for you. Thanks, Laura, for sending the reeds my way, and may your business flourish! Arranged by Akropolis’ bassoonist, Ryan Reynolds, Variations on “America” explores several styles of music, all based on a familiar patriotic theme. This work has been set for several instrumentations, including symphonic orchestra, wind band, and originally, organ. The reed quintet allows for additional exploration into unique colorations and textures. We hope you enjoy our take on this fun, late 19th century romp! Special thanks to the Alpena County George N. Fletcher Public Library for donating their beautiful space, and to Ray Reynolds for operating our third camera. I have this thing about reed cases. I want them to stay like new. Of course that’s rather difficult to do, but at one point I used to sew cloth cases just to keep them looking nicer. How silly can I be? THAT silly! Or even sillier. But oh well! Right now I’m on the hunt for a new case that has the wire clip type holders. I love those. I bought one years ago at a local dealer, but they stopped carrying them. The latches on that case are fried so I have to use rubber bands to hold it shut, and it’s pretty beat up in any case. I occasionally go on a “reed case hunt” online. These days I’m not finding the kind I want. Are the wire clips that uncommon, I wonder? I DID run across a site that has a number of cases. One of them (the typical ribbon holder sort) has “Semi-professionale Oboe reed case” written underneath. Hmm. What makes a reed case “semi-professional” I wonder? 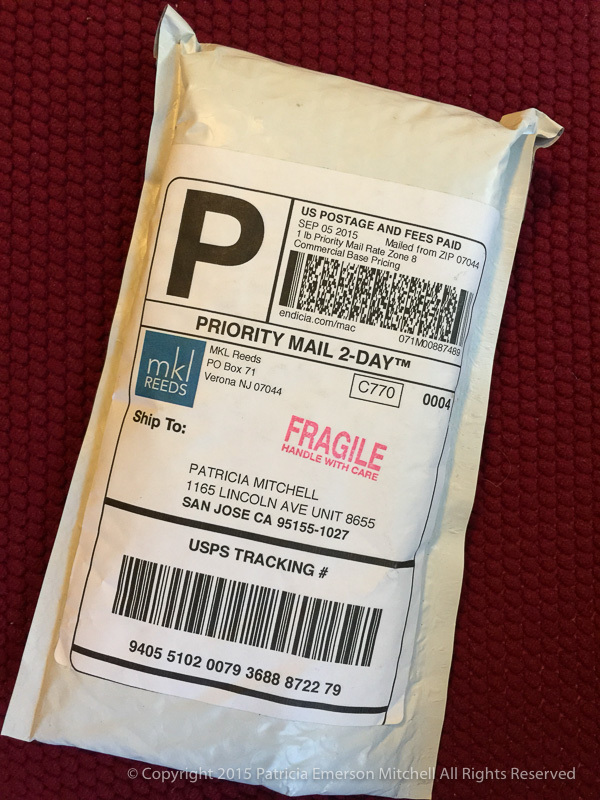 By the way, if you buy the “mandrel” sort, be cautious! They don’t all hold the reeds securely. I had students using those (the plastic ones are very inexpensive so they are provided by the stores that rent oboes) and they’d open the little case and all the reeds’ tips were damaged horribly. Sad stuff. Just don’t even bother. Trust me. Ooh … I see that there is a double sided case that holds reeds in the clip fashion here. I wonder, though, about the double-sided. I prefer to access my oboe and English horn reeds on one side, for the most part, since I frequently double. I’ll have to ponder. A damaged reed? Toss it. Always have more than one playable reed in your reed case. Always. We all need to stay ahead of the reed situation. If you have three working reeds in your case don’t just sit there … order the next batch! Don’t wait until all the reeds are dead. I know some instructors require all of their students to learn to make oboe reeds. I’m not in that camp — probably because I hate to make oboe reeds! The majority of my students have no intention of majoring in music in college. Some plan on playing during college, but that’s all. (Some don’t even plan on that and are using oboe as a “college entrance magic key” … more on THAT in a blog entry, I think.) I’ve decided that the reed equipment to make one’s own oboe reeds, and the time it takes to master reed making (Hmmm. For me that time has yet to come!) isn’t worth it for them. I know some of you will roll your eyes at that, but I just can’t bear the thought of these students, all of whom are already over busy (but that’s another blog entry!) spending hours on a craft they will really not use in the future. 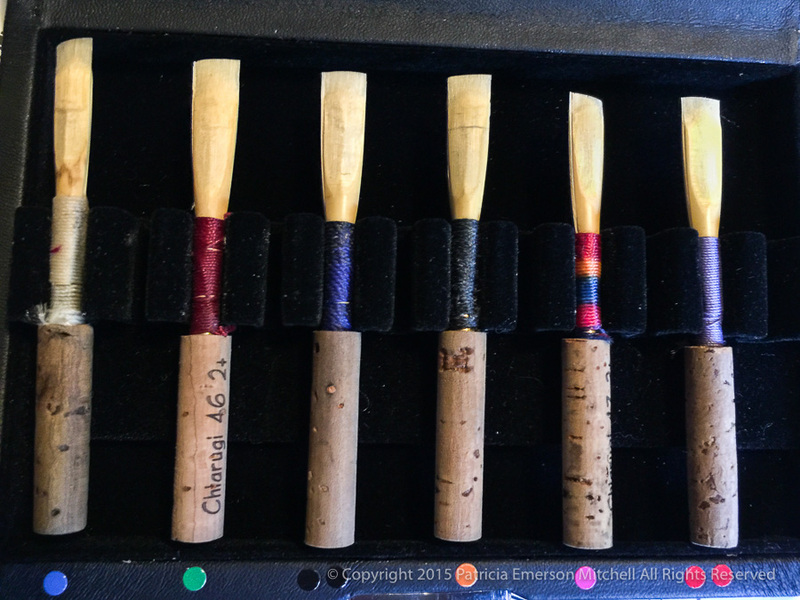 I do think every oboe student should learn to adjust reeds, though; even if you find a great reed supplier (and I have a few I really, really like) you will have to do adjustments on occasion. A few scrapes can turn a reed that won’t crow into a thing of beauty. Okay. Maybe not beauty, but at least the thing will work! Don’t always rely on a teacher to finish them up for you; if you go to college and plan on playing in a group there you won’t necessarily have someone to do that work for you and you might be very embarrassed when you can’t get something to work at all. Oh … and did I mention: always have more than one playable reed in your reed case. Always.